I’ve noticed I have a new habit. After traveling and witnessing all the foods that I either a) can’t eat or b) can eat but with a very high level of stress, I return home and get the itch to cook. I go to the grocery store full of ideas and pick up ingredients for this, for that, and oh I could use this to make a new batch of that! I return home and proceed to enter a cooking frenzy. After a summer full of wedding celebrations and nearly half the weekends spent away, I have just been waiting to have more than a minute at home so that I could start mixing, baking and cooking. I stocked up, and I made balsamic cheddar quinoa with fall apples, I made twice-baked potatoes, and I made bacon. I made pasta sauce and filled four mason jars. I filled up the fridge. No room for even a salad, the Tupperware overwhelmed the shelf space. Anyone else looking inside might have balked, incredulous at the Tupperware that had multiplied on the fridge shelves overnight. I, on the other hand, smiled. I had made it, I had filled the fridge, and I would eat it. With maybe a little bit of help from “A”. I turned from the open fridge door back to the cookbook under my elbows, dreams of home-made empanadas floating through my head. Two days later, the weekend struck and I made maple-bacon biscuits to use the rest of the bacon. I made quiche. I went to the store and bought the ingredients for my vegetarian lasagna. I made pickles. The fridge was stocked, the freezer was filling up, and my stomach was happy. I can always rest a little easier knowing I have some “safe” emergency meals in the freezer. Most people might keep a frozen pizza or ready-to-microwave meal. I keep leftover veggie lasagna, home-made meatballs and personal tangy barbeque sauce. I’ve done this several times now, entering a bit of a cooking frenzy in the days after travel. I think I like to overcompensate for all the foods I missed and couldn’t eat while away. I respond to the billboards on the highway in defiance, saying, “Fine, I can’t eat this now, but I can darn well make it – and make it better – when I get home.” I get home, and I not only need to fill my fridge and my stomach, but the hole in my food-heart that grew in the time I spent away. I’ve talked about “starting the conversation.” I recently experienced family joining in the conversation without even being asked, with a real sense of grace. My aunt and uncle invited A (my boyfriend) and I for a meal. After several times going back and forth about what to cook, and what I could eat, they took the awkward and uncomfortable right out of the conversation and invited us to make a meal with them. (When I am invited to eat at someone’s house, I often will invite them to mine instead. It’s easier to host when you have life-threatening food restrictions, to avoid the questioning and ingredient-label-reading. Making a meal together though – this was a new idea for me!). Together we set out to cook a safe meal. I would be able to see all the ingredients and collaborate in the meal, reducing my anxiety (and some of theirs, too) and creating something safe and delicious. As it turns out, Aunt H and Uncle J love cooking and finding fresh, healthy meals to make from scratch. They have since taught me that making cheese is easy and that cornbread is delicious. On that night, they taught us that making ravioli can be safe, yummy and also unintentionally comical. “Welcome, come on in, you guys!” Aunt H greeted us at the door. “Thank you so much for having us,” I answered as we all exchanged hugs. Before we knew it, Aunt H was at the stove stirring a fresh batch of tomato sauce and telling me about the fresh ingredients while Uncle J, A and myself took turns holding the sheets of fresh pasta we were handing off through the pasta roller. We used more and more hands as we counted and the pasta grew longer and longer. We learned that it is very easy to lose count when you are chatting while rolling pasta out 25 times, and our conversation was interspersed with “15 – is it 15?” – “yes, wait – no that’s 16 times”. Uncle J pulled out some snacks, handing each can and bag over to me to read over the ingredients before diving in. I happily shared which snacks I needed to check, and which foods were generally ok, relaxing as I settled into the care they were putting into my meal. 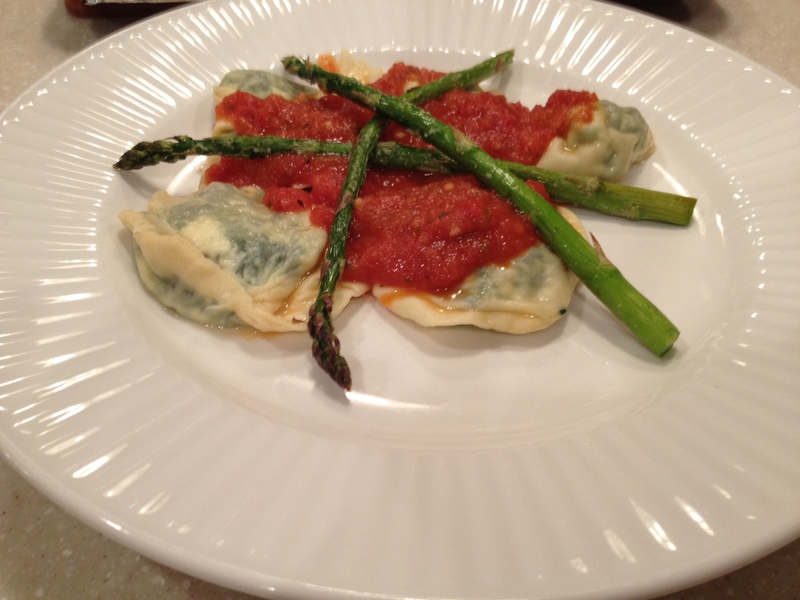 And we decided to add spinach, farmer’s cheese, and feta to our ravioli. I had a moment of panic when I realized we were using frozen spinach. I took the package, relieved that she was not offended – in fact, it felt like the opposite, she wanted me to feel comfortable and stated she would prefer I check the labels if it would make me feel better. It was such a gift to be treated not with defensiveness but with welcome! “Oh, no!” we laughed as the pasta came apart, gently tugging at the edges. Without flour underneath the pasta strips, the ravioli had become glued to the counter. We chiseled the ravioli, firmly adhered to the counter, piecing together the unsealed, misshapen edges as best we could. A and I decided to get creative, wrapping loose ends of pasta around the ugliest ones to hold them together. Aunt H and Uncle J knew better, and laughed at our naïveté as we convinced them to boil the ugly ones anyway. They came apart in the water, bits of unstrung pasta floating to the surface. “You’re eating this one, A!” I laughed as the biggest ball of ravioli (if you could call it that) bounced in the boiling water, bits of spinach drifting out of the ravioli and into the water. “Mmm, looks deeelicious,” he replied with a cheeky grin. “I promise, Aunt H, we will eat the ugly ones!” I claimed as she ladled them out. “You’d better!” she answered, laughing. She and Uncle J arranged them on a plate, and they were beautiful to our stomachs if not to our eyes. 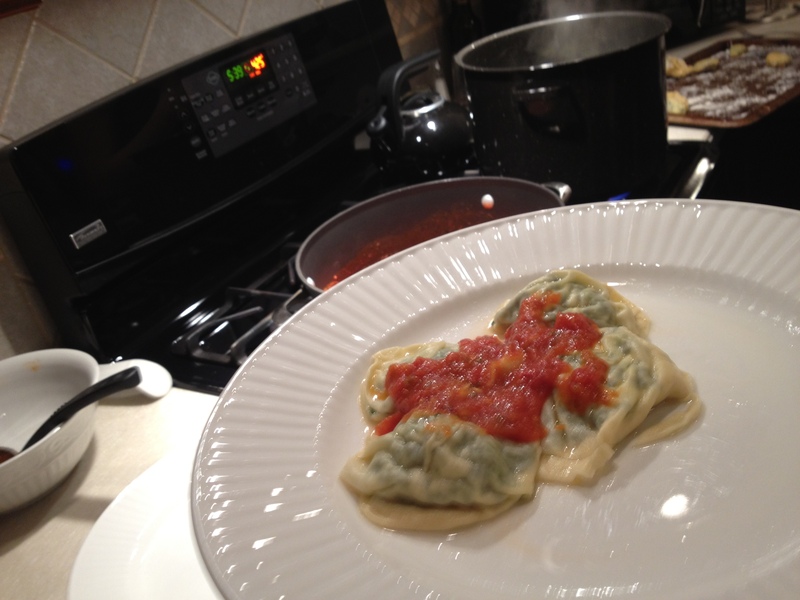 We hashed out the ravioli process, figuring out where we had gone wrong and how to do it better next time. Not only did we have a delicious meal, we had a fun experience cooking together and found a new way to share the conversation – without my food restrictions being a burden on the meal!